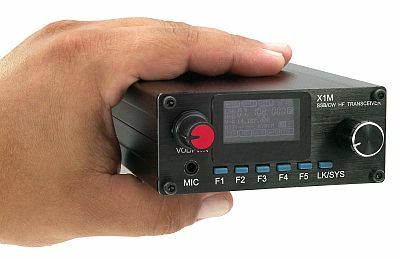 It has general receive coverage & will transmit on all amateur HF bands. Can also be connected to a PC for digital operation. The antenna I use for portable operations is a linked dipole in an inverted vee configuration. At the moment this has 40m, 20m & 10m elements. 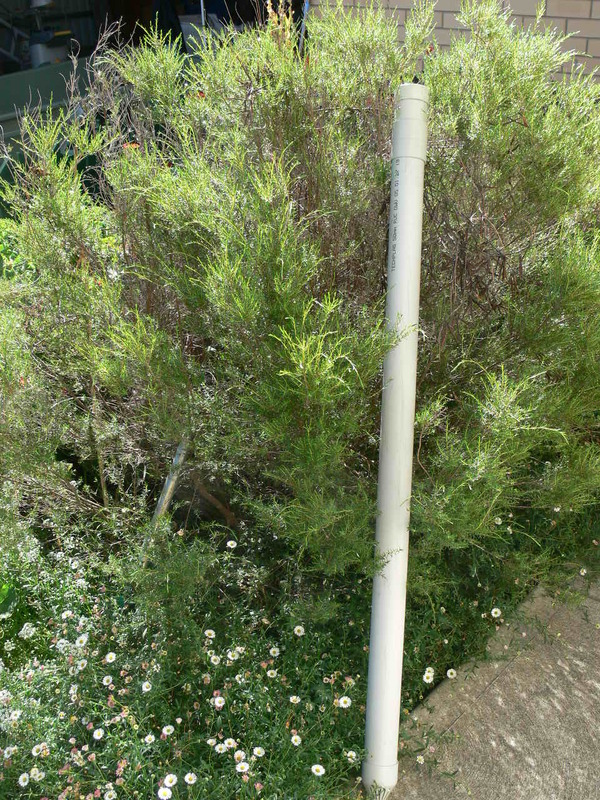 The antenna is held up by a 9 metre squid pole that I bought from the North East Radio Club. The X1M is powered by battery, at first a 7.5AH gel cell but now I am using a 4.2AH LiFePo4 battery that is much lighter. I have standardised on the 50amp Anderson connectors so it is easy to connect the radio in the car, to my power supply or whatever battery I am using. I have a PC headset to listen for calls & eventually hope to incorporate the headset microphone also. When operating I have a small table that I built myself & a camping stool takes care of the seating arrangements. This is much more comfortable than my first couple of activations where both the rig & me were sat on the ground. All the equipment fits into or on my backpack except the squid pole that I carry over my shoulder in a PVC pipe for protection. The desk is usually strapped to the back of the pack. The PVC pipe is 50mm sewer pipe cut to suit the pole. Most times when in a park there may be a stump/post/tree or something similar to attach the squid pole to. But when there isn’t, something is needed to hold it up. Some people use a spike or bring along their own star dropper & drive it in. I found an old metal contraption that was used to hang a sign on. It is a thin rod about 10mm diameter with a cross of flat strap welded to the bottom. The cross pieces have holes drilled near the ends to take tent pegs to hold it to the ground more securely if there is some wind. 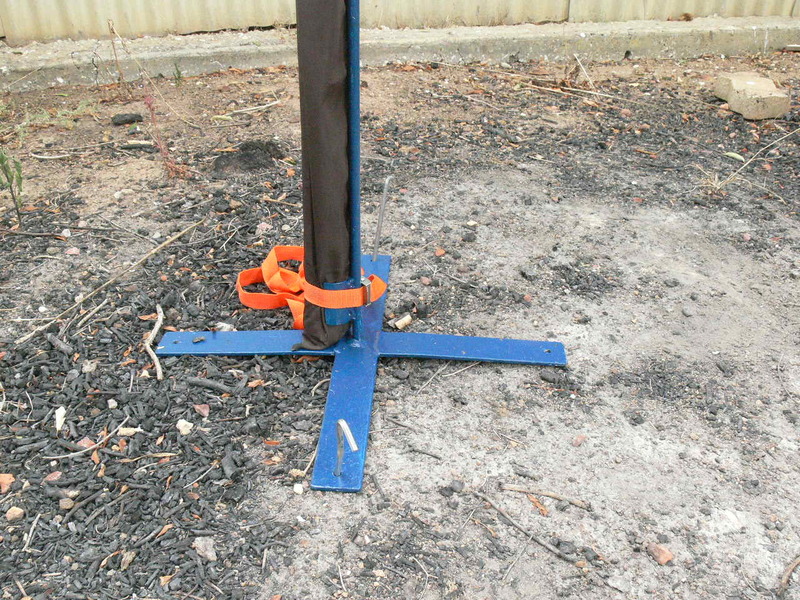 But when I first tried it, it was difficult to securely fix the squid pole to it, as it was too thin. Out came the welder & after cutting a 50mm piece of pipe in half, I welded the two pipe halves at top & bottom to cradle the squid pole & give a bit more surface area for the fixing straps to grip onto. A coat or two of anti rust paint & ready to test. Here is the finished squid pole support. 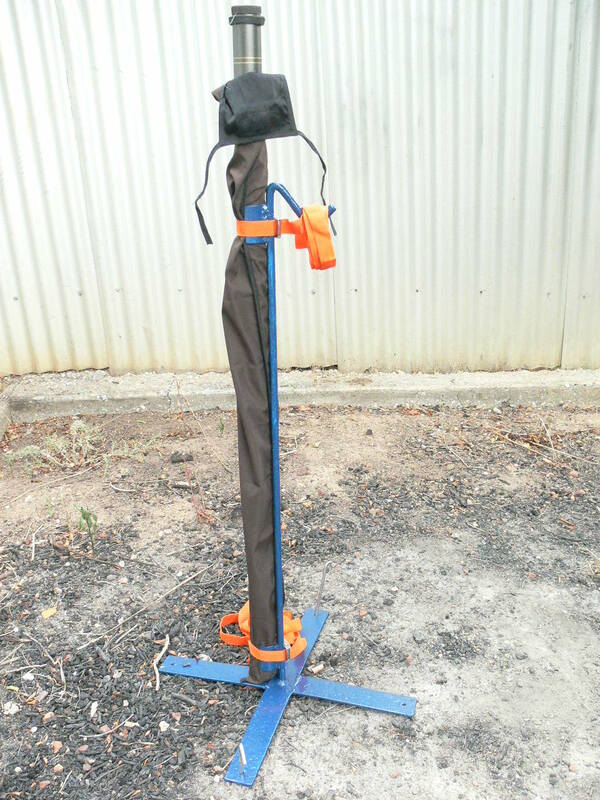 The cover is a fishing rod bag to protect the pole in transport. 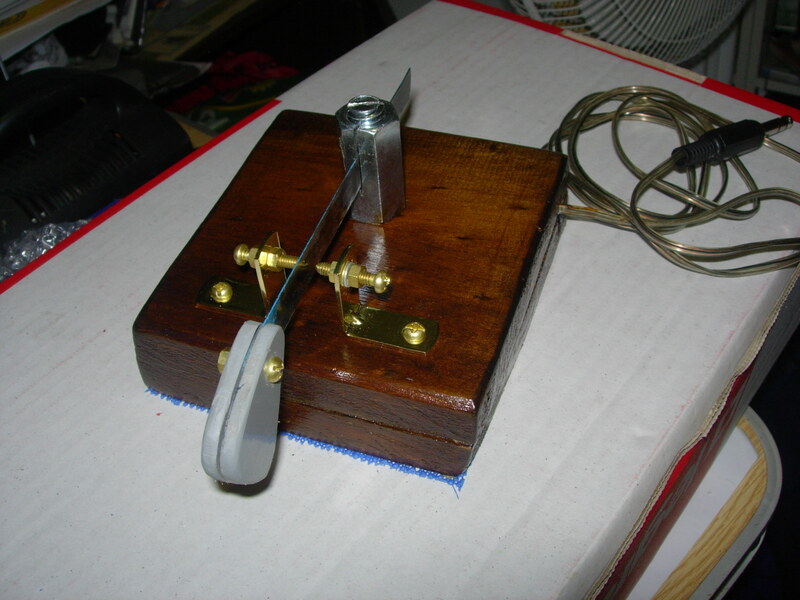 I saw one of these at The Welcome to Radio Symposium run by the Adelaide Hills Amateur Radio Society & after reading about them decided to build one. They work by a side to side motion of the hand between the two contacts that are connected together so either side can produce a dit or a dah. Some are built with an old hacksaw blade & as I had a few of those, that was the direction I took. The main problem I saw was a means of holding the blade. Some designs have a slot in a block of brass that the blade fits into & then a screw or screws tapped into the side of the block to hold it solid. A visit to the hardware shop was next & I found some nice brass L brackets that would be ideal to hold the contacts. As I searched for inspiration for the blade holder I spotted a half inch threaded rod coupler. It is a long hexagon nut in essence made to couple two threaded rods together. It came to me in a flash, a bolt thru the base into one end to hold it. A slot hacksawed down the top for the blade & another bolt screwed down from the top to fix the blade in place. AT home I found a couple of pieces of suitable timber fixed the L brackets & coupler to the top piece & screwd the bottom timber to the top so the connections are hidden inside. I also drilled some holes in the base & melted some lead into the holes to provide some weight & a non slip rubber mat glued to the bottom for extra slip resistance. A couple of coats of stain on the timber & a couple more of polyurethane to make it nice & shiny. Add a couple of pieces of shaped plastic as a handle on the blade, test it out & it works. It is a different feel to a key & it takes a little getting used to & getting the contact spacing right & removing the teeth off the blade & nicely polished for better contact. Very pleased with how it turned out. 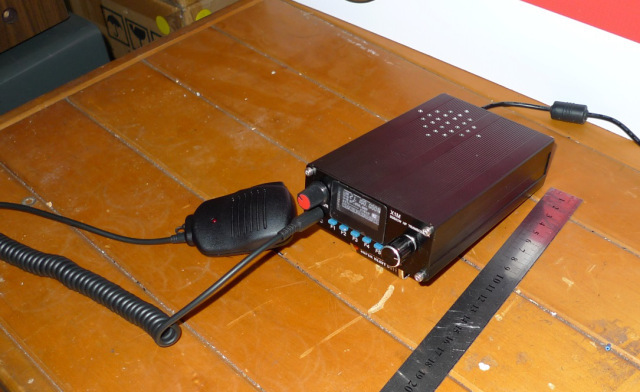 At home I use an Icom IC-718 that is 100 watt output. It has the DSP module that is handy to reduce the background noise a little. 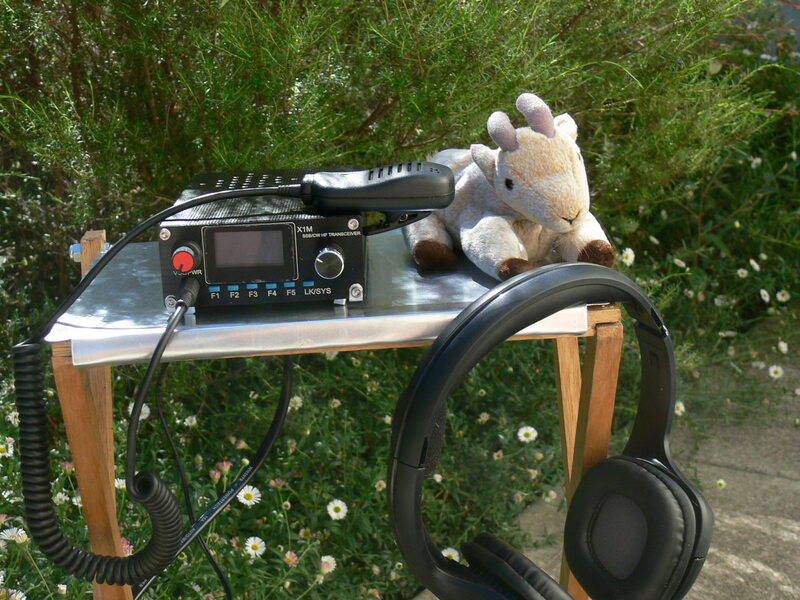 I also fitted the One Board Filter unit from W4RT Electronics that gives a 500Hz CW filter & a 2300Hz filter for SSB.The radio is still quite small & have taken it out on a couple of portable activations to run a little more power (20w-40w) than the X1M. 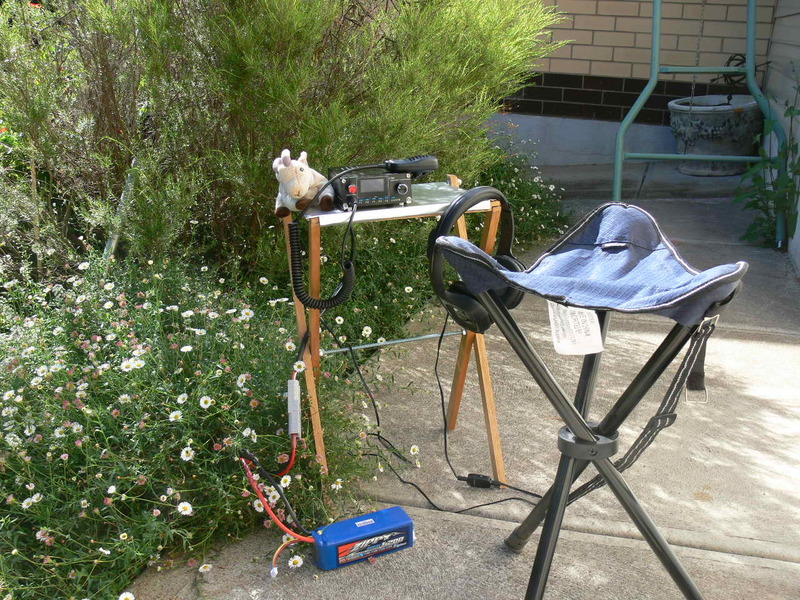 My antenna at home is an 80m OCF dipole. I recently bought the BHI NEIM 1031 to try and cut down on received noise and I am very pleased with how it works. Highly recomended.